I was doing some research on maps mashups recently and I found this little gem called TinyMap.net which can best be described as a marriage of the awesome tools utilized in Google Maps: My Maps and the ingenious everyday Web tool Tiny URL which transforms long URLs into short byte chunks. tinymap.net, originally uploaded by See-ming Lee 李思明 SML. 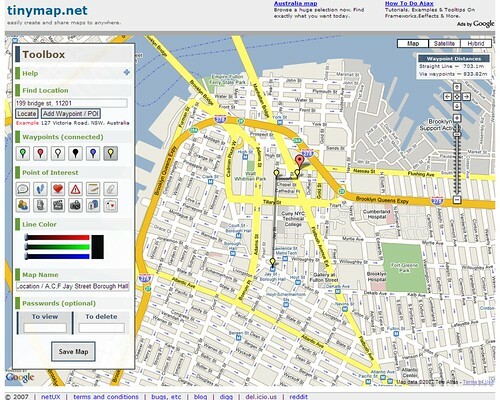 As according to the official step-by-step tutorial, Tinymap.net allows the user to create maps, trace way-points, mark out points of interests with graphic icons and add notes on the Google map. Content creation is surprising easy, and I created my custom map in record time, much quicker than using Google's native UI. One thing I really like about the Tinymap is the ability to create password-protected maps, which allows you to share your map with others without sharing with everyone on the Web. Unless I have mistaken, The My Maps feature on Google Maps can only create private maps that are viewable by one person.